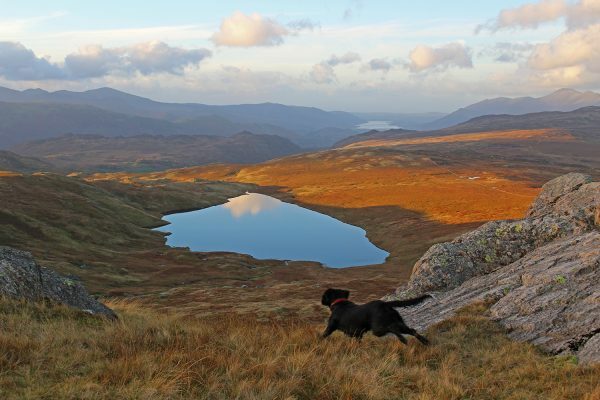 Self-Catering Accommodation to get their Tail Wagging – dog friendly cottages in the Lake District. We want to set the record straight. While we’re called ‘Cottages Made for Two’, it’s a bit of misnomer. Truth be told, we are also home to six cottages that are the stuff of doggy day dreams. So for this page at least, let’s be known as ‘Cottages for couples, plus their trusty canine’. Our self-catering accommodation welcomes man’s best friend – for free (that’s truly dog friendly). Roaring log burner? Lay down, pal. Ample kitchen space for a thirsty slurp? You got it. Seriously, if our accommodation got any more dog friendly it would come with free bones and a back scratch. Which could explain why we were nominated for the Kennel’s Club Dog Friendly Hotel Award in 2018. 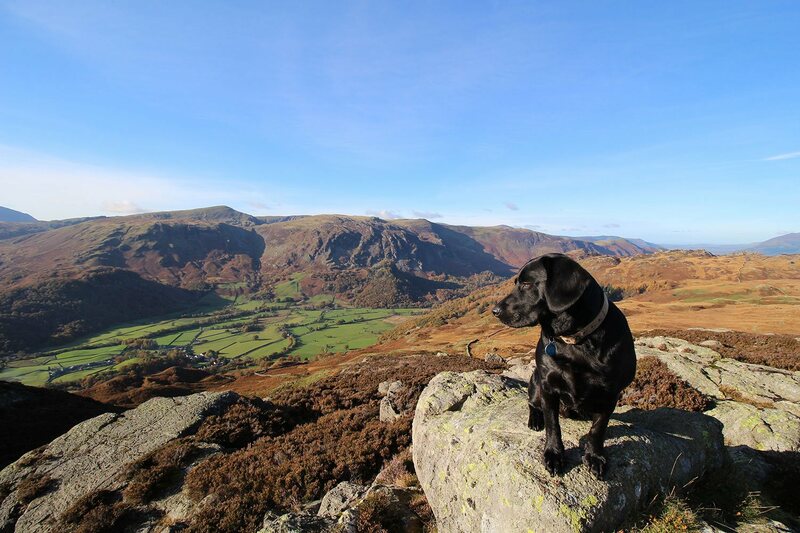 Our dog friendly Lake District cottages are cleaned to the very highest standards; we use the latest cleaning technology to ensure that everything is just so. All we ask is that you don’t allow your dogs on the beds or furniture, and that they’re not left unattended in the cottages or grounds. Booking your next dog-friendly holiday is but a few clicks away. Check our available dates and rates, and book – right here. 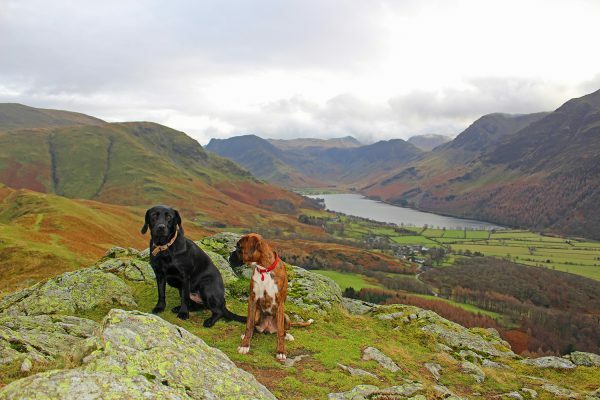 The Kennel Club’s ‘Be Dog Friendly’ campaign has honoured the Lake District as the ‘Best Great Outdoors Destination’ for dogs, while Keswick (the ‘capital’ of the North Lakes) was hailed as the most ‘dog friendly town in Britain’. Safe to say that those paws are going to be busy. We are true fans of our furry friends. In fact, we have two dogs ourselves. 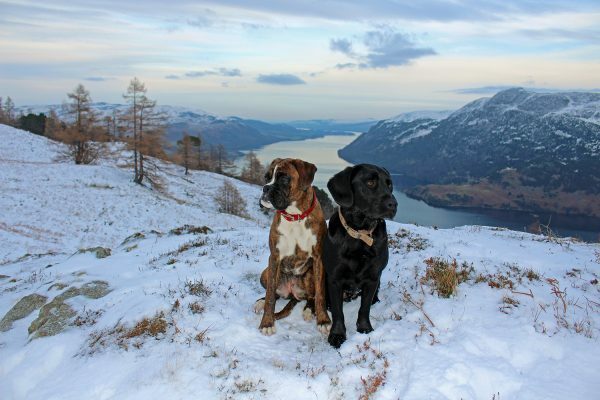 Meet Dasher the Labradinger and Binsey the Boxer. This troublesome twosome accompanies us on our own self-catering adventures, so we know exactly what it takes for a cottage to impress both dog and master alike. 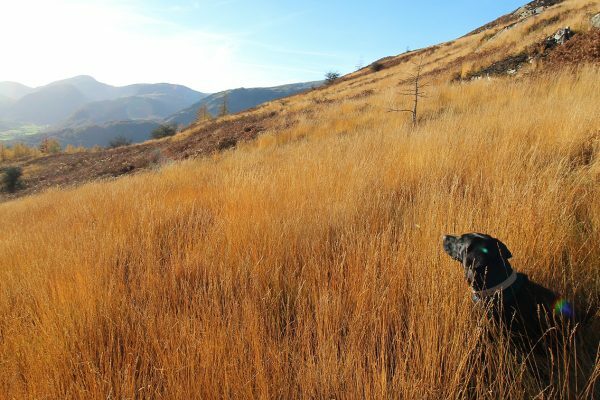 From the moment their paws step out of our accommodation doors, your dog will be treated to a wealth of walks. Take a ramble to Ellen Vale – on your way (if it’s a clear day) take a moment to drink in the sights of the Scottish hills on the opposite side of the Solway Firth. 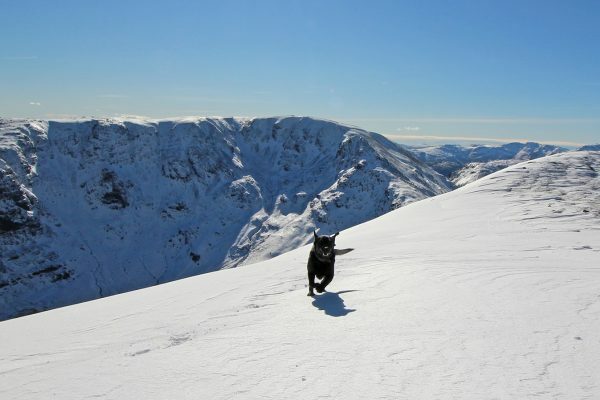 If you and your tail wagging friend are up for a more energised day out, take a walk up Tallentire Hill, where you’ll be able to see the North Western Cumbrian mountains. Be sure to take a pit stop in the stream that runs through the cottage grounds – one dog wash and welcome drink coming right up! Gilcrux has two delightfully rustic pubs which are both dog-friendly. The Mason Arms welcomes dogs whatever the time of day or night (and they also do a mean Cartmel lamb shank!). The Bar’n’Bistro (a CAMRA award winner for ‘Best Pub in West Cumbria’, and an entrant in CAMRA’s Good Beer Guide 2018) allows dogs in before 6 and is particularly popular with our guests. Located just a few dog strides away from Lake Windermere, this place sure makes a dog feel welcome, as they have dog bowls both inside and outside. 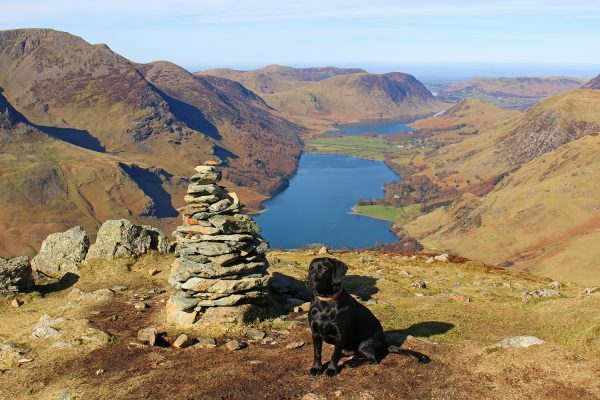 As for you, master, expect some of the most stunning views the Lake District has to offer! Good ol’ traditional bar meals? Check? Veggies catered for? Absolutely. Four Cumbrian cask beers? Bottom’s up! The Bridge Inn has it all and allows dogs on the patio as well as in the Walkers’ Bar. This is an inn with history. Dating all the way back to 1688, the Horse and Farrier serves up delicious food, with leashed dogs welcomed in the bar. Insatiable husky? We’d recommended the 9 mile walk around Derwentwater lake (and for his masters who are firm Star Wars fans, pay attention, as this scenery has served as the backdrop to the smash-hit film Star Wars – The Force Awakens). Looking for sea views or a walk suited to an elderly dog? The Solway Coast provides for great sea faring landscapes with a diverse terrain for dogs of all ages and abilities. Just ten-minutes away from our dog-friendly Lake District Cottages, the Solway Coast has a huge beach, fantastic views across the water to Dumfries and Galloway, and stunning seaward sunsets. It is also dog friendly all year round. 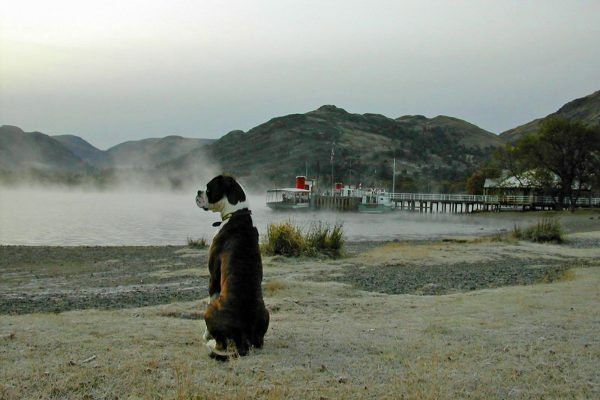 Rydal Water is another suggestion for dogs not steady on their feet, as it runs for just one mile. Finally, if you’re pining for a walk that’ll last the morning, consider Loweswater. Loweswater offers an easy, but relatively long walk (totalling to around 4 miles). Start at the car park at the east of the lake, then make your way into Holme Wood. 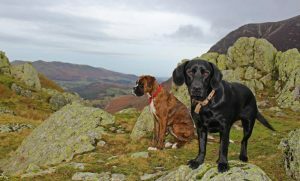 The Lake District is a year-round favourite with dog lovers, so you’ll not be surprised to find that pet shops are ten a penny round these ways. However Dasher the Labradinger and Binsey the Boxer can personally recommend “Podgy Paws” in Keswick for all your treat and dog information needs. Keswick, along with Cockermouth, are also home to many dog-friendly cafes and pubs, as well as having many shops and visitor attractions to explore. Need more ideas or information? We’ll fetch them for you. If you’d like some more ideas for walkies – long or short (or rainy-day alternatives), just ask us during your stay (we’ll be happy to advise). We hope to hear the pitter patter of tiny paws sometime soon! Contact us about our dog friendly Lake District Cottages.